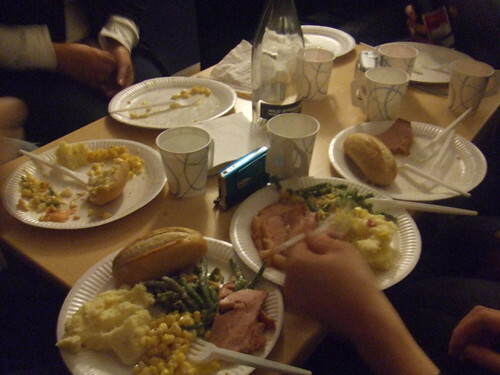 Last night we had our own little Thanksgiving here in Sweden. Megan and Claire put it together, two girls from the University of Illinois (Big Ten in the house haha). It was fun to speak with Americans again though. You don’t realize how much slang and such you use on a daily basis that people who aren’t American won’t get, I don’t know how many times here I’ve had to go “Heh, nevermind.” because of language differences, even in English. So the people there were: Me, Ingrid (Florida! ), Megan (Illinois), Claire (Illinois), and Megan’s siblings who were visiting(also Illinois). But that’s not all. We also had Ian (Canada), Emilien (France), and Inca (Australia). Funtimes! We had a very “traditional” Thanksgiving meal, and with ham! No turkey~! Haha. Though the green beans had parmesan cheese on them instead, what can we do? And Ingrid’s pie wasn’t our Americany pumpkin pie because Sweden just doesn’t have the things to create such a pie. So, it was a pumpkinishy pie. Hey, at least it was orange! It was better than pumpkin pie too. After eating we all went into the hall and attempted to learn Lady Gaga’s “Just Dance” dance moves again. The ones the swedes seem to know from the nollning. But, we got further this time. We’ll have it down soon. I’m sure of it! Also, it’s definitely winter here. It’s been dark for awhile now but to put things in perspective. It’s 4:30pm right now and it’s pitch black outside. It’s still going to get darker earlier too.